A Delta II rocket launches from Cape Canaveral carrying the Dawn spacecraft. This article is about the rocket. For the submarine, see Delta-class submarine. For the airplane, see Fairey Delta 2. Delta II was an expendable launch system, originally designed and built by McDonnell Douglas. Delta II was part of the Delta rocket family and entered service in 1989. Delta II vehicles included the Delta 6000, and the two later Delta 7000 variants ("Light" and "Heavy"). The rocket flew its final mission ICESat-2 on September 15, 2018, earning the launch vehicle a streak of 100 successful missions in a row, with the last failure being GPS IIR-1 in 1997. In the early 1980s, all United States expendable launch vehicles were planned to be phased out in favor of the Space Shuttle, which would be responsible for all government and commercial launches. Production of Delta, Atlas-Centaur, and Titan 34D had ended. The Challenger disaster of 1986 and the subsequent halt of Shuttle operations changed this policy, and President Ronald Reagan announced in December of that year that the Space Shuttle would no longer launch commercial payloads, and NASA would seek to purchase launches on expendable vehicles for missions that did not require crew or Shuttle support. McDonnell Douglas, at that time the manufacturer of the Delta family, signed a contract with the U.S. Air Force in 1987 to provide seven Delta IIs. These were intended to launch a series of Global Positioning System (GPS) Block II satellites, which had previously been manifested for the Space Shuttle. The Air Force exercised additional contract options in 1988, expanding this order to 20 vehicles, and NASA purchased its first Delta IIs in 1990 for the launch of three Earth-observing satellites. The first Delta II launch occurred on 14 February 1989, with a Delta 6925 boosting the first GPS Block II satellite (USA-35) from Launch Complex 17A (SLC-17A) at Cape Canaveral into a 20,000 km high Medium Earth orbit. The first Delta II 7000-series flew in 1990, replacing the RS-27 engine of the 6000-series with the more powerful RS-27A. Additionally, the steel-cased Castor 4A solid boosters of the 6000 series were replaced with the composite-cased GEM-40. All further Delta II launches except three were of this upgraded configuration, and the 6000-series was retired in 1992. McDonnell Douglas began Delta III development in the mid-90s as increasing satellite mass required more powerful launch vehicles. Delta III, with its liquid hydrogen second stage and more powerful GEM-46 boosters, could bring twice as much mass as Delta II to geostationary transfer orbit, but a string of two failures and one partial failure, along with the development of the much more powerful Delta IV, led to the cancellation of Delta III program. The upgraded boosters would still find use on the Delta II, leading to the Delta II Heavy. On March 28, 2003, the Air Force Space Command began the process for deactivating the Delta II launch facilities and infrastructure at Cape Canaveral once the last of the second-generation GPS satellites were launched. However, in 2008, it instead announced that it would transfer all the Delta II facilities and infrastructure to NASA to support the launch of the Gravity Recovery and Interior Laboratory (GRAIL) in 2011. The last GPS launch aboard a Delta II, and the final launch from SLC-17A at Cape Canaveral was in 2009. The GRAIL Launch in 2011 marked the last Delta II Heavy launch and the last from Florida. The final five launches would all be from Vandenberg Air Force Base (AFB) in California. On July 16, 2012 NASA selected the Delta II to support the Orbiting Carbon Observatory OCO-2, Soil Moisture Active Passive (SMAP), and Joint Polar Satellite System JPSS-1 (NOAA-20) missions. This marked the final purchase of Delta IIs. OCO-2 was launched on July 2, 2014, SMAP was launched on January 31, 2015, and JPSS-1 was launched on November 18, 2017. All three of these launches were placed into orbit from Complex 2 at Vandenberg. 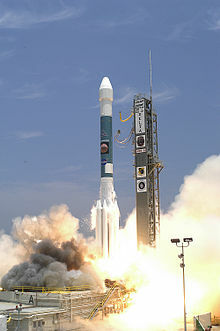 The Delta II family launched 155 times. Its only unsuccessful launches were Koreasat 1 in 1995, and GPS IIR-1 in 1997. The Koreasat 1 launch was a partial failure caused by one booster not separating from the first stage, which resulted in the satellite being placed in a lower than intended orbit. By using reserve fuel, it was able to achieve its proper geosynchronous orbit and operated for 10 years. The GPS IIR-1 was a total loss as the Delta II exploded 13 seconds after launch. The explosion occurred when a damaged solid rocket booster casing ruptured and triggered the vehicle's flight termination system. No one was injured, and the launch pad itself was not seriously impacted, though several cars were destroyed and a few buildings were damaged. In 2007, Delta II completed its 75th consecutive successful launch, surpassing the 74 consecutive successful launches of the Ariane 4. With the launch of ICESat-2 in 2018, Delta II reached 100 consecutive successful launches. While all completed Delta II rockets have launched, many flight-qualified spare parts remain. These spare parts will be assembled to create a nearly-complete Delta II, for exhibition in its 7420-10 configuration. The rocket will be displayed vertical at the Kennedy Space Center Visitors Complex, and may bear its popular "shark teeth" livery on its fairing, which was painted on past Delta II rockets for the GPS launches. The first stage of the Delta II was propelled by a Rocketdyne RS-27 main engine burning RP-1 and liquid oxygen. This stage was technically referred to as the "Extra-Extended Long Tank Thor", a derivative of the Thor ballistic missile as were all Delta rockets until the Delta IV. The RS-27 used on the 6000-series Delta II produced 915 kN, while the upgraded RS-27A used by the 7000-series produced 1,054 kN. The stage was 26 meters long and 2.4 meters wide, weighted over 100 t when fueled, and burned for 260 seconds. In addition, two LR101-NA-11 vernier engines provided guidance for the first stage. For additional thrust during launch, the Delta II used solid boosters. For the 6000-series, Delta II used Castor 4A boosters, while the 7000-series used Graphite-Epoxy Motors manufactured by ATK. The vehicle could be flown with three, four, or, most commonly, nine boosters. When three or four boosters were used, all ignited on the ground at launch, while models that used nine boosters would ignite six on the ground, then the remaining three in flight after the burnout and jettison of the first six. 4. These propellants are highly toxic and corrosive, and once loaded the launch had to occur within approximately 37 days or the stage would have to be refurbished or replaced. This stage also contained a combined inertial platform and guidance system that controlled all flight events. The Delta-K stage was 6 meters long and 2.4 meters wide, containing up to 6 t of propellant, and burned for up to 430 seconds. For low Earth orbit, Delta II was not equipped with a third stage. Payloads bound for higher energy orbits such as GTO or to reach Earth escape velocity for trans-Mars injection or other destinations beyond Earth used a solid propellant third stage. This stage was spin-stabilized and depended on the second stage for proper orientation prior to stage separation, but was sometimes equipped with a nutation control system to maintain proper spin axis. It also included a yo-weight system to induce tumbling in the third stage after payload separation to prevent recontact, or a yo-yo de-spin mechanism to slow the rotation before payload release. The first digit is either 6 or 7, denoting the 6000- or 7000-series Deltas. The second digit indicates the number of boosters. The third digit is 2, denoting a second stage with an Aerojet AJ10 engine. Only Deltas prior to the 6000-series used a different engine, the TR-201. The last digit denotes the third stage. 0 denotes no third stage, 5 indicates a Payload Assist Module (PAM) stage with Star 48B solid motor, and 6 indicates a Star 37FM motor. An H following the four digits denoted that the vehicle used the larger Delta III GEM-46 boosters. The Heavy variant could be launched only from Cape Canaveral (as Vandenberg's pad wasn't modified to handle the larger SRBs), and was retired with the closure of that launch site in 2011. Numbers and letters following those indicate the type of fairing. -9.5 means that the vehicle has a 9.5 ft diameter fairing, -10 means a 10ft diameter fairing, and -10L indicates a lengthened 10ft diameter fairing. For example, a Delta 7925H-10L used an RS-27A, nine GEM-46 boosters, a PAM third stage, and a lengthened 10ft diameter fairing. A Delta 6320-9.5 is a two-stage vehicle with an RS-27 first stage engine, three Castor 4A boosters, a 9.5ft diameter fairing, and no third stage. A Delta II launch vehicle was assembled vertically on the launch pad. Assembly starts by hoisting the first stage into position. The solid rocket boosters are then hoisted into position and mated with the first stage. Launch vehicle build-up then continues with the second stage being hoisted atop the first stage. It took approximately 20 minutes to load the first stage with 37,900 liters (10,000 U.S. gal) of fuel. At T-45 minutes, fueling completion is confirmed. At T-20 minutes, the FTS pyros are armed. At T-20 minutes and T-4 minutes, there are built in holds. During these holds, final checkouts are performed. At T-11 seconds SRB igniters are armed. Ignition is at T-0.4 seconds. The ascent profile varies between missions. If 9 solid rocket boosters were used, only six were ignited at launch. Once the first six were depleted, three air-start motors would ignite and the ground-start motors would separate. The air-start motors had nozzles optimized for high-altitude as they operated mostly in a near-vacuum during the flight profile. If 3 or 4 boosters were used, all were ignited on the ground and jettisoned at the same time. The last Delta II launch was the ICESat-2 satellite in September of 2018. In 2008 ULA indicated that it had "around half a dozen" unsold Delta II rockets on hand, but ULA CEO Tory Bruno stated in October 2017 that there are no complete, unbooked Delta II rockets left in the ULA inventory; and though there are leftover Delta II parts, there are not enough to build another launch vehicle. The remaining pieces will be used to create a museum piece for the Smithsonian. The only person on record ever hit by space debris was hit by a piece of a Delta II rocket. Lottie Williams was exercising in a park in Tulsa on January 22, 1997 when she was hit in the shoulder by a six-inch piece of blackened metallic material. U.S. Space Command confirmed that a used Delta II rocket from the April 1996 launch of the Midcourse Space Experiment had crashed into the atmosphere 30 minutes earlier. The object tapped her on the shoulder and fell off harmlessly onto the ground. Williams collected the item and NASA tests later showed that the fragment was consistent with the materials of the rocket, and Nicholas Johnson, the agency's chief scientist for orbital debris, believes that she was indeed hit by a piece of the rocket. ^ Kyle, Ed. "Delta II Data Sheet". www.spacelaunchreport.com. ^ Dawson, Virginia (2004). Taming Liquid Hydrogen (PDF). p. 233. ^ "Reagan Orders NASA To Halt Launch of Commercial Payloads". Associated Press. Aug 16, 1986. ^ a b Rumerman, Judy (2009). NASA Historical Data Book, Vol. VII: NASA Launch Systems, Space Transportation, Human Spaceflight, and Space Science, 1989-1998 (PDF). NASA. pp. 49–51. NASA SP-4012. ^ "Archives copy" (PDF). Los Angeles Air Force Base. Archived from the original (PDF) on 14 April 2016. ^ McDowell, Jonathan. "Launch Log". Jonathan's Space Page. Retrieved 10 July 2012. ^ "ULA Delta II successfully lofts OCO-2 to orbit". NASASpaceflight.com. July 2, 2014. Retrieved July 26, 2014. ^ "Delta III Data Sheet". Space Launch Report. Retrieved July 27, 2014. ^ Cleary, Mark. "DELTA II & III SPACE OPERATIONS AT CAPE CANAVERAL 1989 – 2009" (PDF). afspacemuseum.org. Retrieved 18 November 2017. ^ "Delta II". SpaceflightInsider.com. Retrieved 18 November 2017. ^ "NASA Selects Launch Services Contract for Three Missions". NASA. 16 July 2012. ^ Krebs, Gunter Dirk. "Koreasat 1, 2 (Mugungwha 1, 2) / Europe*Star B". ^ "Unmanned rocket explodes after liftoff". CNN.com. 1997-01-17. Retrieved 2009-03-31. ^ "DigitalGlobe Successfully Launches Worldview-1". DigitalGlobe. ^ "Ariane 5's impressive 75 in-a-row launch record". SpaceDaily. Retrieved 2017-11-19. ^ "Leftover Delta 2 rocket to go on display at Kennedy Space Center – Spaceflight Now". spaceflightnow.com. Retrieved 2018-09-17. ^ "Space Launch Report". www.spacelaunchreport.com. ^ "RS-27". Astronautix. Archived from the original on August 13, 2011. Retrieved July 27, 2014. ^ "RS-27A". Astronautix. Archived from the original on August 5, 2014. Retrieved July 27, 2014. ^ a b c "Delta II Data Sheet". Space Launch Report. Retrieved July 27, 2014. ^ Dr. Marc D. Rayman (2007-07-15). "DAWN Journal". JPL NASA. Retrieved 2008-09-06. ^ a b "Delta II Payload Planner's Guide 2007" (PDF). ULA. Retrieved 24 July 2014. ^ Forsyth, Kevin S. (2007-08-10). "Vehicle Description and Designations". History of the Delta Launch Vehicle. Retrieved 2008-03-15. ^ a b Graham, William (July 2, 2014). "ULA Delta II successfully lofts OCO-2 to orbit". NASASpaceflight.com. Retrieved July 23, 2014. ^ "Expendable Launch Vehicle Status Report". NASA. June 6, 2007. ^ "Swift Launch Pad Activities". 2004-11-18. ^ "NASA Selects Launch Services Contract For Three Missions". MarketWatch. 16 July 2012. Archived from the original on 29 January 2013. Retrieved 16 July 2012. ^ "NASA Selects Launch Services for ICESat-2 Mission". NASA Kennedy Space Center. 22 February 2013. Retrieved 15 March 2013. ^ Berger, Brian (2008-06-30). "Delta 2 Rockets to Remain Competitive Until 2015". Space News. ^ Ray, Justin (8 April 2015). "What to do with the final Delta 2 rocket?". SpaceflightNow.com. Retrieved 18 November 2017. ^ "Space Junk Survivor". 3 March 2017. Retrieved 2 January 2018. ^ Long, Tony (22 January 1997). "Jan. 22, 1997: Heads Up, Lottie! It's Space Junk!". Retrieved 2 January 2018. This page was last edited on 7 March 2019, at 21:40 (UTC).